A University of Manchester laser expert has received one of the Royal Academy of Engineering’s highest accolades – the Sir Frank Whittle medal – for his outstanding and sustained research achievements for engineering innovations in manufacturing that have directly benefitted the UK economy. 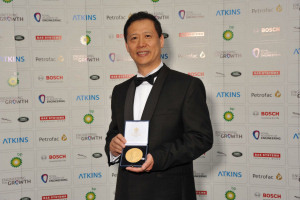 Professor Lin Li, from the School of Mechanical, Aerospace and Civil Engineering, received the medal at the Academy’s annual Awards Dinner today (Wednesday) at London’s Battersea Power Station, where special guests included HRH The Princess Royal and Chancellor George Osborne. Professor Li, Head of the University’s Manufacturing Research Group and Director of the Laser Processing Research Centre, pioneered the development of laser and materials processing technologies for manufacturing in several industrial sectors. Collaborating with Rolls-Royce and BAE Systems, Professor Li’s team has developed a laser cleaning technique that has been deployed in the aerospace industry to replace conventional chemical cleaning for a range of component manufacture processes resulting in reduced scrap rates and environmental impacts. Working with BNFL, he, with his colleagues, invented a technique called 'laser scabbling', which is now being commercialised for nuclear power plant decommissioning. A laser is used to separate highly contaminated surface concrete in a nuclear installation from the bulk concrete structure, so that the remaining bulk concrete can be treated as low-level nuclear waste, dramatically reducing the decontamination process and cost. In collaboration with Delphi and GFH GmbH, he led the research in novel hole drilling techniques for fuel injection nozzle manufacture, which led to the worldwide applications of an electro-mechanical drilling technique in diesel cars and trucks with improved fuel efficiency and reduced environmental impact. His scientific work in the use of non-conventional laser beam geometry for materials processing has inspired the car manufacturers for laser joining of car roofs utilizing a special beam geometry for the control of heat flows. Professor Li’s expertise has also been called on by the medical devices industry in manufacturing devices like coronary stents and inhalers. Working with Swiss Tec AG he led the research to investigate the scientific phenomena in water-assisted laser machining and fibre laser machining of coronary stents, which reduced the need for post-processing. Such a technique has been commercialised by Swiss Tec AG for the medical industry. Professor Li also led research into the understanding of scientific phenomena in laser demetallization of nanometre thick metallic threads imbedded in transparent polymers, in collaboration with De La Rue Ltd. Such a laser etching technique is now being used for banknote security thread manufacture used in currencies of many countries. But it’s not just lasers and advanced manufacturing techniques. He and his research team recently discovered that one can increase the resolution of an optical microscope by up to four times beyond the conventional theoretical optical resolution limit of optical microscopes, thanks to the magnifying and special optical effects of micro-sphere lenses. Such technology allows one to see nano-scale structures (down to 50 nm) without having to use an expensive electron microscope. The potential benefit of this technology is to allow scientists to study live virus (too small to be seen directly using standard optical microscopes) and their interactions with cells and drugs. Named after the UK's jet engine genius, the Sir Frank Whittle Medal is awarded to an engineer, normally resident in the UK, for outstanding and sustained achievement which has contributed to the well-being of the nation. The field of activity changes every year and in 2013 the medal is being awarded for Engineering Innovations in Manufacturing.